This 5-day/4-night tour is packed with unforgettable sights and adventures. 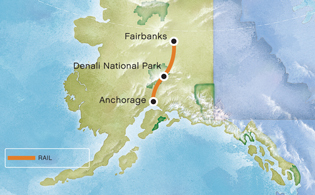 Board a luxury railcar and journey south from Fairbanks to Denali National Park. Upon arrival into Denali, transfer to your hotel and enjoy ample time to explore the area. The following day, enjoy a morning at leisure or take an optional tour like river rafting or ATV'ing. Enjoy dinner and a show at the Music of Denali Dinner Theater at McKinley Chalet Resort featuring family-style dining and a spirited original musical about the first men to reach the summit of Denali. Later, re-board a luxury railcar at the Denali National Park rail depot and continue south to Anchorage. Experience scenic vistas and watch for wildlife as you travel. Wake up early for an optional scenic tour of Denali National Park like a horse-drawn covered wagon tour or an exciting optional heli-hiking, fly-fishing or golfing excursion. Later, board luxury rail and journey in comfort and style back to Anchorage. Overnight Anchorage hotel.